When it comes to kitchen lighting, pendant lights are a great choice for blending function and style. 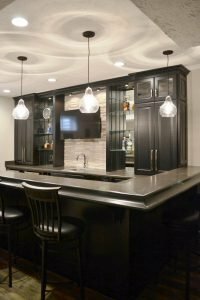 Pendant lights are suspended from the ceiling, and work well over a counter top or island to provide lighting for food preparation and service. With pendant lighting, an odd number of lights is usually preferable. We recommend installing 60-75 watts of lighting for every 20 inches of counter space you’re lighting. As far as style goes, the choices are endless and as unique as your home. Here are a few of our favorite uses of pendant lighting in some recent kitchen remodels. Often we think that pendant lights have to be narrow, but they can also have a fuller look. We love the contrast of these round black shades over the bright white counter top, and they provide plenty of light over the island and sink. 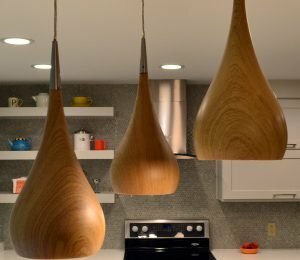 These wooden pendants have a unique shape, and are the perfect touch in a modern kitchen. Varying the length of your pendants is an easy way to play with the style and provide different levels of light. 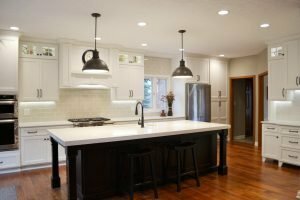 Pendant lights are often used over a countertop, but that’s not the only place they’re effective. 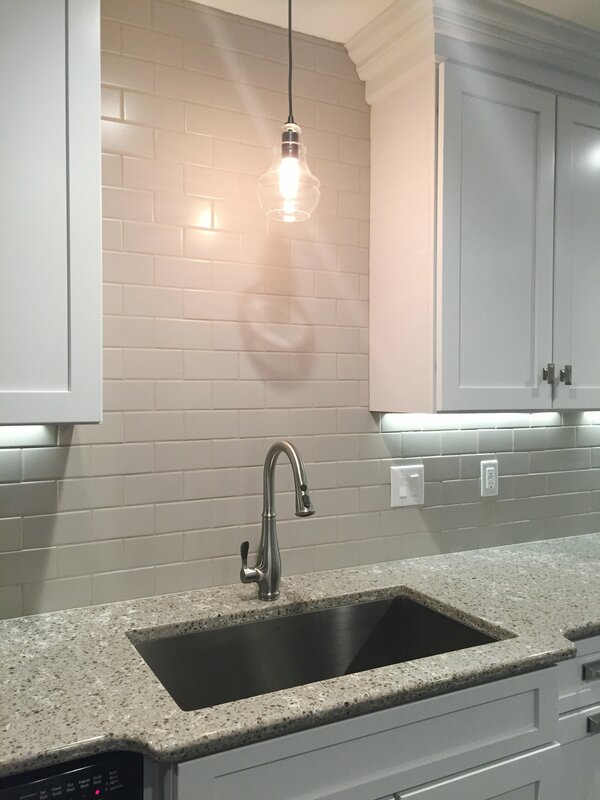 A single pendant over the sink is a gorgeous statement. The clear globe allows the light to become a design element as well. Pendants aren’t just for the kitchen! 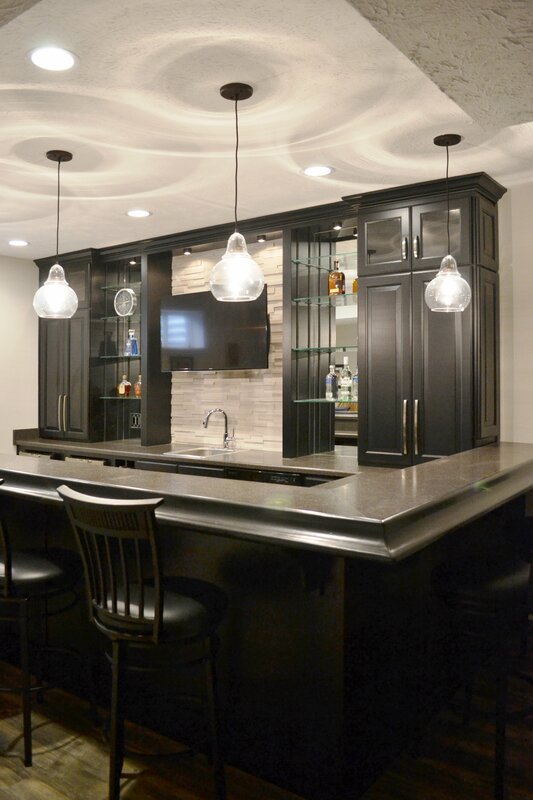 We used pendant lighting in this recent bar remodel, with awesome results. There’s plenty of light over the bar counter, and once again the clear globes allow the light to create beautiful patterns. Are you looking to update your kitchen and shed some light on your workspace? Our team can help you plan your improvements and choose the right style of lighting for your setting. Contact us today to get started, or stop by our showroom with your questions. For more inspiration, follow us on Houzz to keep track of our recent projects.